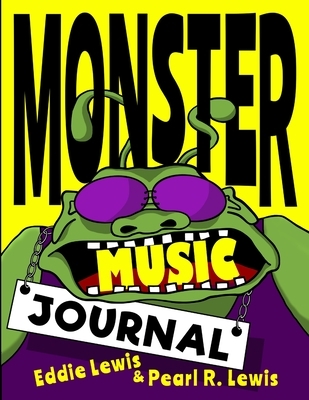 The MONSTER MUSIC JOURNAL is a wild and whacky, monster-infested space for you to fill with music compositions, transcriptions of your favorite songs, music theory exercises, and other monstrous bits 'n bobs. The generously spaced staff lines make writing musical notes easy for beginners (or for those who like to live life BIG). Plus, there is plenty of writing space for non-musical notes, so you can include song lyrics, love letters, or even scribble a doodle or two. The book is heavily illustrated with monster characters that will tickle the imagination of kids and adults. Created by the musician and illustrator husband-and-wife team, Eddie and Pearl Lewis, this music journal has many uses. Let it turn dull, repetitive music theory exercises into an adventure at every turn of the page. Suggest the illustrations as prompts for improvised music. Or use the journal to introduce young musicians to composition and transcription. Music homework just got an upgrade on the fun scale.